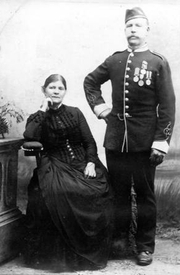 An image of old soldier Bartholomew Stagpoole* and his wife Mary Ann nee MacEnulty*, circa 1870 New Plymouth, Taranaki, New Zealand. Bartholomew’s army record states that he was born in the parish of Kilcummen, near the town of Outerard*, Galway and that he attested for the 57th Britsh Imperial Regiment at Loughrea on 24 January 1848. Bartholomew’s parents are known to be John Stackpoole* and Honora O’Malley. His two brothers were Martin Stagpoole and Dudley Stagpoole VC DCM. Dudley’s army record states that he was born in the parish of Kilunan* (possibly Killannin) near the town of Galway. The three brothers fought in the 57th regiment in Crimea. They then travelled with the regiment to Malta, India and New Zealand. Dudley was awarded his bravery medals for rescuing comrades under fire during the Taranaki Land War in 1863. After ten years of marriage Mary Ann and her children were able to travel with the army and they joined Bartholomew in India. Later they settled in New Zealand. None of the family ever returned to Oughterard. * Denotes incorrect or alternate spelling on the records. This page was added on 28/10/2013. Our ancestor, James D’Arcy,son of Peter D’Arcy of the Galway Militia, attested to the 57th Regt of Foot in Galway in 1821. He and his pregnant wife Mary(Faherty)marched with the Regiment from Galway in 1827 to Chatham docks and Sydney Australia, the soldiers of the regiment acting as guards of the convicts being transported to Van Diemens Land. James is recorded in ship’s payrolls as making a number of journeys back and forth to England and Tasmania,over four years. Andrew Molloy was also on the 57th payroll in Australia. The 57th Regiment left Australia for Madras, India in 1831 and James and Mary’s second son Patrick was born there. James was invalided out of the army in 1837 to Northwich, Cheshire on a small pension (6p a week) for two years only. His family was impoverished and his sons turned to crime. He died in Northwich aged 82. His descendants have done well, with recent generations becoming teachers, a doctor, and business professionals. The late Leslie John D’Arcy served in the RAF in WW2, became a teacher and much later a world veteran Table Tennis Champion, in his late 80’s! The Darcy’s in England have, over the generations, married in England with Downes, Fahy, Joyce, and been close friends with a Molloy family from Wakefield. All local names to Oughterard! Les and members of his family visited Glann in 2005 to trace the pathway to Glann and James’s family’s homeland. We were stunned by its beauty and will never forget the homeland that James Darcy left behind. We left our blessings in Glann Church to honour the ancestors in their beautiful valley.